This is my favourite nail art product I've ever reviewed! I am definitely stocking up on them, I think they're so cool! It's the Zip Decor from Born Pretty Store. You can see it on the ring finger in the photo below, and on the thumb in the photo after that. I wasn't sure how I was going to use them at first - but then I found this tutorial and thought it was awesome! I adapted it a bit (might make a video tutorial on the way I did it) and was really pleased with the outcome. It looks so clean and perfect! After making the jean/demin design on my nails, I added the zips on the thumbs and ring fingers. The zip decors were very easy to use - just cut them out, put them in water for 10 seconds and apply to the wet nail. It goes on just like a temporary tattoo, actually. It's best to cut around the zipper quite closely, as that makes it easier to position. I dried them briefly with a hair dryer after applying them. I thought mine were gold, but they were silver when they went on the nails - weird! Not that I care, they're amazing either way. I actually just don't want to take these off. EVER. SO MUCH AWESOME. You can find these at Born Pretty Store here. They're only $2.99 and have free shipping :). If you use my discount code you'll get 10% as well! This are great. 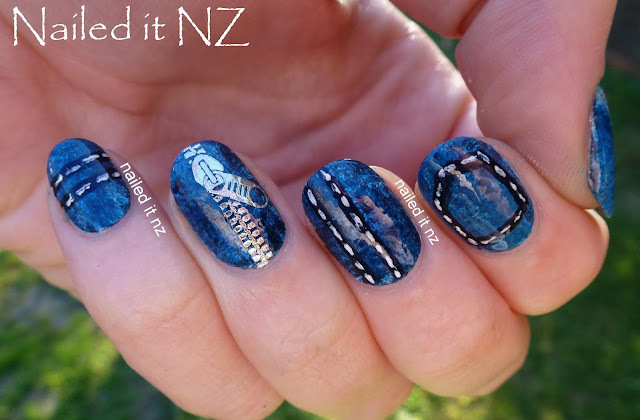 Probably some of my favourite denim inspired nails!